Clarets defender Ben Mee feels Burnley could take a lot of positives from the defeat at Southampton on Saturday. Sean Dyche’s men went down 2-0 to a Shane Long strike and an own goal from skipper Jason Shackell. 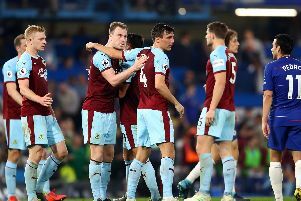 But Burnley created a number of chances, forcing Kelvin Davis into three key saves, and George Boyd felt he should have had a penalty after a first half challenge from Jose Fonte. Mee said: “We had chances, it’s just putting them away. Maybe we should have had a penalty as well. “Southampton is a tough place to come and I thought we set our stall out really well and took the game to them. Davis was in inspired form after replacing the injured Fraser Forster after 14 minutes, but Mee revealed strikers Danny Ings and Sam Vokes felt they should have given him no chance: “The keeper pulled off some great saves, but the lads were disappointed they haven’t scored - they gave him a chance to make the saves. “Southampton played the ball around a lot more in the second half and kept it better, but they have some good players and they killed the game off.